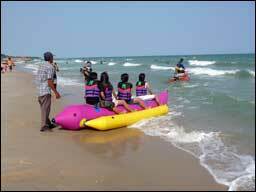 The driver takes you to Bleu Wave beach. Sunbeds, towels and umbrellas are available for a small price or free when you order drinks and food. Local vendors stroll by selling their products like bikinis, t-shirts, fruit, ice cream, etc. Or have a massage or a manicure with one of the Thai ladies. 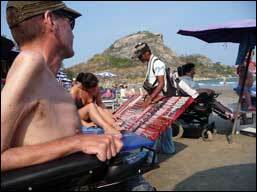 Enjoy the beach, the sun and the water in the beach wheelchair of your choice. 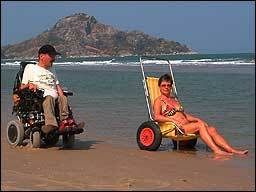 Beach wheelchair available on request. Return trips can be booked on the spot, but preferably one day before. Price THB 750 return trip.